University of Lynchburg will rename its Alumni House to honor Charles and Billie Sue Walker, two alumni and public educators who supported the College with numerous gifts, including a recent bequest. 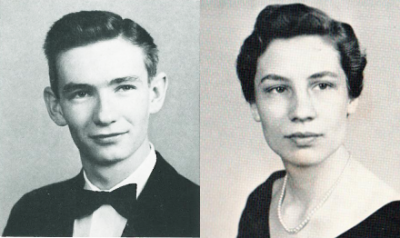 The building will be rededicated as the Billie Sue Morecroft and Charles Raynor Walker Alumni House in a ceremony on April 23 at 1:30 p.m.
Charles and Billie Sue Walker as seen in their senior University of Lynchburg yearbook photos. The decision honors the spirit of conversations Charles began with leaders of the College in 2008 when he offered to make a gift to name the Alumni House. Although the recession postponed his plan, he continued to name the College as the primary beneficiary of his estate. He passed away on July 14, 2015. His wife, Billie Sue, died in 1997. Both of the Walkers were members of the Christian Church (Disciples of Christ) who attended LC with the support of scholarships, which fueled their later desire to give to their alma mater. They met each other during his last semester at LC. Although they sang in a choir together during those few months, they did not get to know each other well until Charles completed military service and they both worked for a Disciples of Christ school in Missouri in September 1957. They were married December 1 that year. The couple worked in the Roanoke City Public Schools for many years. Billie Sue taught elementary school and her husband was a principal and an elementary education supervisor. They also grew orchids on a farm near Roanoke and were active volunteers in the community. “They thought that not only was it a great college, but they were very impressed with the outlook and dedication of the people they knew there,” said Claude Carter, Charlie’s cousin and a lawyer in Roanoke. After Billie Sue died in 1997, her husband established the Charles R. Walker and Billie Sue Morecroft Walker Scholarship Fund for LC students with demonstrated financial need and good academic standing. Charles then immersed himself even more in community service. He volunteered frequently at the Blue Ridge Library and the United Methodist Home. In the early 2000s, he informed the College that he was updating his will to leave most of his estate to LC.